well today happens to be my 38th birthday.. holy crap. That sounds old coming out of my mouth. I feel like I am not a day over 21 (except I weight more and look a lot older).. but I FEEL that young. actually I think I enjoy life MORE now than I did when I was 21.. I know I do. It's awesome how time and age and life, and trials and happiness and heartaches and amazing experiences.. can change you and shape you and mold you! I wouldn't give any of it up.. and I have to say.. and say this HONESTLY.. today is my best birthday ever... why? Because Today.. and right now.. and at this time. I feel SO at peace and full of happiness with my life. With my relationship with my children, my friends, my Family.. My heavenly Father.. and the most important one.. my husband! can I tell you how much I love THIS MAN??? holy cow I love him. Truly the most kind, loving, forgiving soul. This year has been one full of many ups and downs.. but it's been truly a blessing how its all ended up. I am in awe. SO today is a wonderful day just because it is! Okay.. sorry got sidetracked.. so on our birthdays.. the rule is you get to spend the day doing whatever you want! lol.. I always tell my kids and friends and family..
"its your birthday.. do what you want, eat what you want and be what you want today!" its YOUR Day! so of course I am taking my own rule to heart! lol?? why not right? So lately I have been sketching these girls.. She art girls.. some with faces, some without..kinda different.. indians, old world, ethereal.. different kinds. And so today I am finally going to take the time to paint some of them! I think I might start one or two.. probably one finish any of them.. but I cant wait!! I wanted to show you a peak of some of them.. these are just scanned in from my sketchbook..
this is my favorite as far as hair goes.. I call her "she had courage"
I am really into Indian/tribal inspired things right now. I find myself buying them for my home, for my studio.. jewelry (chevron earrings, arrow ring.. antler necklace... I love Indians because they remind me of strength, family, honor, commitment, to be still and quiet and listen. Another word that describes them is Courage. I have also recently went through something that took a lot of COURAGE.. and I hadn't really thought of that about myself for a long time.. until a dear friend of mine.. Chrissy.. said to me one day a couple of weeks ago.. "you are courage" and I just stick with me.. I have decided it's my new word.. for 2013.. and I think we will just start it now.. :) I love my trues! Next girl.. she is also indian.. but a little more simple. I just love how she looks like she is strong and steadfast.. how she has a cloak around her neck. She is humble and simple.. but she is TRUE!! The next one.. is inspired by a movie i recently saw.... on tv. Gladiator.. I Love the girl/sister in that movie.. I haven't named her yet.. haven't decided what role to give her. I don't know if you remember that movie.. but the girl that is the Gladiators love interest.. wants to badly to help him. She knows he is good.. and yet she is stuck in a position because her brother is the king and he is a wicked person. She kinda goes through this good bad thing and struggles with what everyone else thinks is right and what she KNOWS in her heart is rights.. shes gonna be a fun one to paint. Lots of emotions behind her.. This next girl.. she is just super fun. I saw picture on pinterest recently and I fell in love with her hair. reminded me of I love Lucy for some reason? ..
She was vibrant and full of life"
really is there anything else to say? She just exudes life! She is bright and colorful.. I think I need to do her with her lips turned up a bit.. and a twinkle in her eye.. a calm lovely smile on her face.. that's for sure! This last one.. as far as faces goes.. IS MY FAVORITE!!! I love her expression and how she turned out.. and she is truly SO simple. Her eyes are so warm and loving and inviting.. and her smile is just so that she really invites you in. She is open yet she has something mysterious about her.. She is BEAUTIFUL yet she is truly so simple. Simple cotton dress, hair simply done. I think maybe even leaving the earrings off might be perfect for her too. I dont know what her name is yet.. but It will come..
My other freaking amazing friend Meredith.. wanted to take me to lunch too.. so we are going to try and work something out for later..
so today is a good day. Wonderful day. I wanted to also thank all of you.. SO truly wonderful and feel blessed to have you all in my life! I feel very full today.. of love and gratitude.. thank you all..
Mugs, Iphone covers, lamps and more! They are in my store! wahoo! Okay friends! Totally unexpected but guess what?? A lot of my product came this week for my etsy store! BUT I just listed a TON of fun things! AND because we need to celebrate that..
when you check out in etsy and receive 10% off!! These cute ornaments.. can either hang.. from a door, wall, on a swat.. a tree. OR they have a fun little metal stand, so they can sit just about anywhere! Great gifts for Christmas! Lamps of course (I have all of them :).. just showing one! Wood Plaques (9"x9" in size.. with my printed artwork on them.. and includes a metal embellishment!) 3 different styles! AND good news! I fixed my video editing! yeah!! so we will have some fun stuff next week! Monday.. if my hopes work that way I want them too, i will have a video for you on the October Mixed Media kit! wahoo! So today.. this is what is on my mind.. I wish I had some fabulous new thing to share with you today (though I am proud of myself for creating something new (that isn't for one of my classes, that I can't share on here)..
do you realize that? do you know that in the last three months I have created over 40 new pieces of artwork? lol isn't that sad? but most of it's for my online workshops.. so I can't always share it here. I show snippets..but not full on pictures. Well okay I do have something to share today.. I listed some new Originals in my etsy shop! I can share those with you!! :) and some new prints too! these are just a few..
also listed some new prints..
She did what mattered most. oh how I love painting animals right now.. thanks to Juliette Crane and Mindy Lacefield. :) thank you sweet girls. She was created... a new she art girl..
magnets, resin girls, clocks, art bags (for brushes or other art studio products), IPHONE covers and mouse pads! I know I am forgetting something.. but there will be a lot of stuff! so I can't wait to share! It will be listed in my etsy store and should be listed by end of next week! love to organize and clean your studio for you.. I know you hate letting people do stuff for you, but I love organizing, so can I please do it for you? " I sat for moment and wanted to say no..because I truly have issues with letting people serve me.. it's more because I feel dumb than anything. But in my HEART i knew I needed the help. I knew in a couple of weeks that I would be moving into my new studio.. and would need my current studio organized enough that I could easily move it. And let me tell you it was a MESS! lol. Does that surprise you? probably not. So I let her... and can I tell you.. she did the MOST AMAZING job!!! I mean she sorted everything! and put them in their own baskets or boxes.. perfect ready for me to move into the new studio where I have lots of furniture with lots and lots of organized drawers for everything to have it's place! talked about her life and what she wanted it to say and words she had in mind. She even picked out some of the papers I used. Then she said in a chair and watched as I went to work on her very own She Art girl. I can't tell you HOW humbling and fun that experience was! It was a little nervous.. because I wanted it to be perfect for her.. but I truly enjoyed the process. So I wanted to share with you the canvas I created for her! but before I do.. I wanted share something else with you! offer this to my own friends, customers and blog readers! Soo.. Just to let you know.. i have added NEW originals to my etsy store again.. just a few this time.. BUT also have listed a custom She ARt girl original for anyone who wants me to paint one especially for them. This custom canvas would also include a skype or phone call sesion with me.. as I would LOVe to get to know you and the reason I am creating the peice for you! I want to learn about your story and your heart.. things that move you.. colors you love. Words or phrases or scriptures that inspire you. I want this to be a TRULY custom piece! So if you are interested in that! Check out my etsy store!! and also check out all the new originals I Just listed! so without further wait.. her is the She Art girl I created just for Granny Annie.. silver hair and all. what a beautiful lady she is! Well that's it! Thanks again for letting me share! I hope you have a wonderful day!! and remember.. Bless this mess online workshop starts in just a few days! Hope you join me and Junelle for Wild Art no. 2!! but most of you probably know that last year I signed a contract with an licensing agent and soon after my artwork was picked up several companies for artwork on their products for 2012. Well while we worked hard on all of that lAST year I have been soo patiently waiting to see the actual product as it only started shipping this fall! AND LAST week to my wonderful happy surprise! boxes and boxes of fun stuff starting coming! From all the different people I did licensing with.. fabric from Studio E, mugs, resin girls, plaques plates, journals from Carsons, Frames Art prints with Die-cuts with a view (featured in Bed, Bath and Beyond! HOW COOL! ), and then my biggest line, mugs, magnets, keychains, mugs, wood girls on stands, canvas, clocks, magnet boards, paper weights, pillows, cosmetic bags (I think they would be great for storing art brushes or alchool inks! ), aprons, lamps and more! All with Midwest.. seriously my living room is overflowing with stuff!! I took a few pictures with my ipone because I just had to share.. so they aren't that great.. but oh I wish you could all see it in person! I have started having friends text me saying they have seen them in their local home decor stores (in Utah and Arizona and california!) So they are starting to pop up everywhere! They just started shipping about a month ago to stores.. so that is super fun! anyhow.. I will be carrying some of the things in my etsy store. Mugs, iphone covers, journals, and probably the resin girls, maybe some magnet boards.. heck I want to carry it all.. but really don't have the room for all the inventory in our warehouse right now! But I will carry a few things! probably be here in the next month or so! I am also in the middle of trying to find another online store that carries my products.. all of them, since I won't be! BUT you can go to their website and click on find stores and put in your zipcode and It will pull up any stores near you! I just did it and surprised to find 12 stores in my area that carry them! I live in super small town! So that is awesome! Gonna have to go check it out! Anyhow.. so here is a peak! SO FUN!! fun little frames, keychains, coasters, journals! large magnet boards and wood figure stands, jewelry boxes, trinket boxes. SEriously LOVE these lamps!!! totally going in my art studio! It has just been SO fun to go through it all! Truly! So I am working right now on ordering stuff to get it into the shop and as soon as I have a link to any online stores that carry the different products, I will let you know too! We will be soon adding the fabric to our Scarlet Lime store.. in packs.. so watch for that! okay so before I go I needed to remind you of TWO THINGS!! one.. you can NOW sign up for the LIFE BOOK class for 2013!!! so not on my traditional sites.. but Tam is amazing! You will love her! and my last reminder.. my newest workshop.. with Junelle Jacobson.. The Art of Wild Abandonment no. 2.. BLESS THIS MESS.. starts NEXT week!!! you still have time to register on the early bird price!!!! Seriously.. you will love her.. and love love love this class! I have been so excited to film the videos for it and working with her on it.. she is a keeper that girl.. for sure! anyhow.. that's my news for today.. I also have to say THANK YOU for your wonderful comments and love last week on my post about moments. Each day has continued to be a challenge, but it has also continued to be amazing and wow ever so thankful! I have decided I love the challenges because they always seem to end in just a new perspective and a deeper love and appreciation. Wednesday or thursday I will be back with a fun video.. a she art girl video I did this past weekend for my husband's mom. Ben's Parents are in town and they have been amazing and helping us around the house, at the warehouse, with dinner. Well Granny Annie (ben's mom) cleaned my entire studio!! (my current one).. she organized it all so when I move in a couple of weeks to the new studio.. I can pack and unpack easier! SHE IS AMAZING! it took her three days! She has wanted a piece of artwork for a while.. so I decided to just go out and make her one.. just for her. A portrait of her. So she and allie sat and watched and we talked while I made it for her.. and she reminded me I should video tape it and share it on my blog! So I did.. SO I will share that this week! anyhow.. have a wonderful day! what I was feeling, or hearing or seeing was true. Either for good or for bad. whispering and promptings we are given to know and feel truth. are going to happen. Whether it's conscious or sub conscious.. I believe our spirits know. struggling with and trying to figure out.. finally finally came to it's moment. and courage moment of love, clarity and truth. and so it came.. and as hard as it was.. I have to tell you. the Lord TRULY loves us!! charity and LOVE and closer to my Heavenly Father, my family and my Savior. don't want to do them.. i just FORGET..
become those moments we remember and WANT to remember forever. reminded me of what I already knew.. but just couldn't seem to remember..
burning in my soul that said.. you can do this! you can make it through this! Everything will be okay and this will a great and wonderful thing you will cherish forever. express to you how full my heart is. I know this trial isn't completely over..
learning and growth in my Testimony of what we as human beings are and should be. I just think I will leave this post as it is. friends that I have never met who give me hope and love and strength. I swear..
did before.. if we will let it. love you all.. truly and honestly.. love you all. Its a happy thursday isnt it? hello beautiful friends! What a GOOD DAY today is! last night I was feeling SUPER crappy.. ate popcorn and that seems to make my fibro bad no matter what I take to make it feel better.. but it was just sitting there on the counter.. the GOOD kind.. from the movie theatre (my mom came into town to watch Ethan play his football game and celebrate his 10th birthday!) and she took my kids to the movies and brought a HUGE bucket home. Popcorn from the movie theatre is my weakness. I looked at it and looked at it and NEW i was going to cave.. and I did. AND ONLY one handful! and withing 20 mins.. sure enough.. oh had felt SOO crappy. So I took some medicine and went to bed.. and I had the best nights rest ever! Slept in until 10:00 lol. (that probably wasn't smart since I have a million things to do). but it felt good and I am in a great mood and today I get to see my sister!! and last night ethan made a touchdown (his first ever!!) and yea well life is good. Guess what else I did this morning? I totally re-organizes my entire workshop page.. it seemed like it was so confusing and so many different things to sort through to find classes. so I created a page where all the class were on one page with links to each one if you want to learn more! So now when you click on the workshops tab.. you will see a beautiful organized page! wahoo! A few weeks ago I was telling you about a special collaborative class I am doing with some amazing artist.. it's called LIfe Book!! and it starts Janaury 1st! Well you can officially sign up starting October 8th.. and if you want to know more about it.. you can check it out here! I will also send out an email reminder on the 8th about it!! it's coming up so soon! AND my last "class update".. not sure if you saw my last post and facebook post about an amazingly fun "home decor" crafty, artsy online class that my amazing talented friend.. Marige Romney-Aslette is doing.. but its called Spooky Spark! and it's full of amazing beautiful projects for Halloween! Her style is so chic and vintage and classic.. perfect for home decor, parties and more.. seriously I got so many great ideas for my home this year! AND for halloween parties we have coming up! You have to check it out!! you can read all about it.. here! so ya that was fun.. a bunch of great classes coming up..
oh wait! there is one more starting soon too!! MY NEWEST workshop!! With Junelle Jacobson!! Bless this mess.. the Art of Wild Abandonment No.2! It starts October 23rd! Less then two weeks away! it's going to be amazing! I have been watching her videos all week long, so I can make my projects for the class and I am BLOWN away by it's contents.. Junelle actually wrote a little blurp to me about it..
another wild jump into all kinds of creative possibility! in the group -- you will have loads of new sketch/watercolor ideas to try. and ideas, extra projects, and a rocking facebook group that loves to share! and bless your creative play, inspiration and personal style. I told you it's going to be amazing!!!!! Junelle seriosuly rocks. You can sign up for the special early bird price still.. so check out THIS page for more info and to join us!! Bless this Mess Class info! Anyhow.. yes.. I know.. I am full of great info today huh? okay.. I better get.. I am going to spend the afternoon with my sister and I can't wait! I only get to see her a couple of times a year, so I am super excited! But before i go.. I have to tell you all THANK YOU!! HUGE HUGE THANK YOU!!! I was soo nervous.. SOO nervous to start selling my original work in my new etsy shop.. and wow.. the response was AMAZING! I seriously cried I was so grateful. You are all amazing and wonderful! some of you have emailed me.. so here is more info about it. I will be posted original artworks every week (probably on monday's) for the next few weeks.. that will be for sale.. and ALSO starting next week will be posting prints of my artwork. We will also be getting in some of my licensed products like my mugs, pillow, frames, wall decor, resin girls, etc and I will carry those in my etsy shop as well. So it wil be a fun place to get anything related to my own personal artwork. I can't wait :) Thank you again for your wonderful wonderful support of my creative life.. YOU AMAZE me! love you all! well hello! i finally DID IT! I can't believe it! I am like the picture taking freak! oh well.. we still have the memories right? I will have to write down in a journal everything we did. I am really into animals latley.. so I thought this would be fun and it WAS! okay.. so did you happen to notice my header? YEP! that's right.. I changed it.. decided I Needed a facelift of some sort. 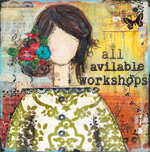 I also added all of my workshops to the right sidebar over there.. so you could find them more easily. I am going to be changing some of my sidebar things very soon.. excited to update this old blog.. BUT did you notice my newest addition to my header? My new link? My "etsy" shop? Yep! That is RIGHT!! I have opened a NEW etsy shop!! FINALLY! after a year of wanting too.. needing to I guess.. i finally did it. Let me tell you why it took me so long though.. this is really personal.. so bare with me. so you may or may not know that I don't sell any of my original artwork. I actually have only given away a handful of prints. All to really close friends and ONE I donated to an auction for another close friend. AND last year.. I took the plunge and did sell one of my original artwork pieces to a dear friend I had met through my classes.. she emailed me (love you laura) and she pursauded me with a very dear story about how one of my pieces had touched her heart.. I had such a HARD time letting it go.. but after hearing her story and knowing her funny and sweet personality through my classes.. I KNEW it was right and it would be going to a good home. So I sold my first piece of art. Its funny because I teach my art.. I license my artwork, I have sold prints at some of my events before.. but NEVER my originals. The reason being that they are so dear to my heart! I start to get this ancy feeling in my stomach about letting something I Love so much and that has a story behind it go.. and also selling it to someone I don't know. But latley as I have been organizing my studio to move to my new studio.. I realized I really can't just take all of it because I don't have the space for it. And right now it just sits in piles on shelves. SO then I thought.. well I COULD sell it.. and then again.. had a freak out moment.. of seperation from my art, and someone not loving it as much as I did. SO I stop and cast that idea aside. SO I am starting out small. Just listing a few originals each Week.. or every other week. Right now I only have originals in my store. BUT in the next couple of weeks I will be listing prints as well. Anyhow.. so today is the first day of my shop being open! Yeah!! Some of these you may have never seen before as they created and shared only in my workshops.. or some of them just for me..
and probably my most favorite one of the bunch.. one that I shared on my blog as a free print in THIS blog post.. and had a LOT of meaning to it..
so there you go! eek! this is exciting and scarry at the same time! lol.. who knows.. maybe that won't even sell.. but at least I am finally cutting some apron strings and letting some of these go.. and realize that through sharing these.. I am also growing myself! I will let you know when I add new things to the shop! My prints will be coming soon. and will post about it here when they do! Wednesday I have some fun things to share! So stay tuned!